Everyone in Bayport is talking about the first annual skateboard contest. The winner gets free mac and cheese balls from The Easy Cheesy food truck for the whole year! Frank and Joe just wish there was someone to beat the school’s biggest bully, and best skateboarder, Diesel Diffendorfer. 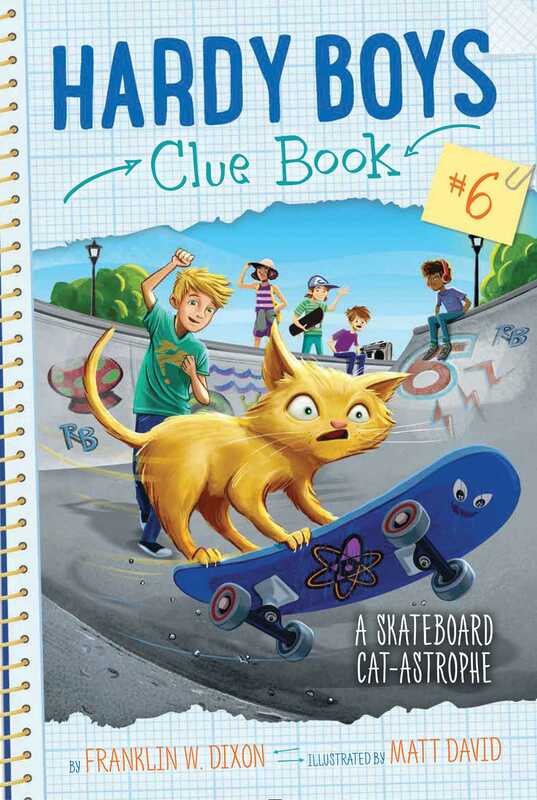 Then their best friend Chet shows them a video of Skeeter the skateboarding cat…a cat that happens to belong to the new kid in town, Carlos Martinez. Suddenly, a plan is hatched. Carlos agrees to enter Skeeter, in the contest. Who wouldn’t want free mac and cheese for a year? But just when Skeeter hits his final trick, a mouse runs across his path! Distracted, Skeeter hops off his skateboard and chases after his furry foe. When Frank and Joe run to catch him, they discover the mouse was a toy. Could someone have sabotaged Skeeter’s big day? It’s up to the Hardy Boys—and you—to find out! Joe and his nine-year-old brother, Frank, gazed at the crowd gathered around the obstacle course. It had been set up in the park for the Bayport Skateboard Challenge in just two days. The Easy Cheesy truck was parked a few feet away. The macaroni-and-cheese company was holding the skateboarding contest that Saturday. Frank and Joe traded grins. If Diesel was Bayport’s champ skateboarder, Chet was Bayport’s champion snacker! “The winner also gets a gift card to the Complete Athlete store downtown,” Frank added. “Plus free skateboard lessons from a national pro!” Joe chimed in. Frank, Joe, and Chet turned to see Daisy Zamora from school. Following Daisy were her six-year-old twin brothers Matty and Scotty. The Zamoras owned the Pizza Palace restaurant on Bay Street, and Daisy never let anyone forget it. “Uh . . . what’s your point, Daisy?” Frank asked. The twins’ mouths dropped open. “So don’t expect those new scooters you wanted!” Daisy snapped. The twins stared, horrified, at Daisy, then at each other. They then hurried after Daisy to the next group of kids. The boys began walking toward the truck until a grinding noise stopped them in their tracks. Glancing back, they saw Diesel Diffendorfer carving his skateboard in their direction. A tiny dog stood in Diesel’s path. He jumped his skateboard over the dog, showed off with a kick-flip, then continued toward the Hardys and Chet. “Hey!” Joe shouted as the three jumped to the side. Diesel screeched to a stop, the nose of his board only inches away from Frank, Joe, and Chet. He popped his flame-painted skateboard out from under his feet. Frank and Joe traded eye rolls. They knew that laugh anywhere. It was nine-year-old Adam Ackerman, school bully and now best buds with Diesel! As Joe spoke, he secretly placed a hand over the back pocket that held his clue book. The small notebook was where he and Frank wrote down all their clues and suspects. If Adam saw it, he would grab it for sure! In a flash Adam loomed over Joe. “I dare you to find a better skateboarder than Diesel, Hardy,” he growled. From the corner of his eye, Joe could see Frank and Chet coming to his rescue. Luckily, they didn’t have to. . . .
Joe looked over Adam’s shoulder to see three kids racing over. They all wore T-shirts reading, GO DIESEL! Adam shot Joe one last glare, then left to join Diesel and the fans. “Who’s better than Diesel?” Frank asked. Chet pulled a small computer tablet out of his backpack. He opened YouTube, then searched for a video of Skeeter the Skateboarding Cat. “The skateboarder is a cat?” Frank asked, surprised. Frank and Joe watched wide-eyed as the gray-and-white tabby cat ran his skateboard down a ramp and over a rail, then jumped obstacles like a pro! “Skeeter is awesome!” Joe declared. “How do you know?” Frank asked. Frank nodded. Their mom, Laura Hardy, was a real estate agent in Bayport. “So Skeeter must be his cat,” Chet said excitedly. Joe smiled. It was cool having a pet celebrity in their hometown. It was also cool to have a new kid around. The boys lunched on fried mac-and-cheese balls and lemonade before leaving the park for the Martinez house. The boys started up the path to the front door. Joe was about to ring the bell when he heard a rumbling noise. The noise grew louder and louder as Frank, Joe, and Chet walked along the side of the house. When they reached the backyard, they couldn’t believe their eyes. . . .
Set up in the Martinezes’ backyard was an elaborate course of rails, ramps, and quarter pipes. Running a skateboard through the course was a gray-and-white cat! “I think we’re looking at Skeeter!” Frank said. “I think we’re looking at the next Bayport skateboarding champ!” Joe declared. Two of Skeeter’s paws were planted on the board as it zoomed up and down a quarter pipe. The boys watched in awe as the cat spun his board around and around! A boy wearing a T-shirt and shorts walked over to Frank, Joe, and Chet. “Pretty awesome, huh?” he asked. “I’ll bet you’re right!” Carlos said with a grin. Frank, Joe, and Chet introduced themselves. Skeeter needed no introduction. “Have you seen Skeeter’s videos?” Carlos asked. “What do you mean?” said Carlos. “Enter him in the Bayport Skateboard Challenge on Saturday,” Chet chimed in excitedly. “Meeeeooowww!” Skeeter howled before jumping a patio chair and landing on his board.